According to a feature provided by the Christian Science Monitor, drip-irrigation systems are becoming a boon to regions suffering from persistent drought. “Now, however, a drip irrigation system, introduced to help his village deal with worsening drought, is restoring his harvests, building his resilience to erratic weather, and saving time, he says. ” ‘You simply open the tap and leave the kit to supply water to the roots, unlike the traditional system, which takes a lot of time and energy,’ he said. Nguluma Mbaga, a Kikavu Chini agricultural field officer, says the technology has come at the right time as farmers try to find ways to cope with worsening drought and other effects of climate change. 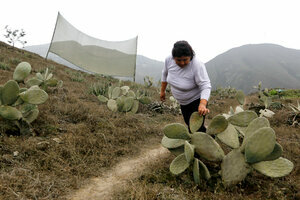 A farmer cleans prickly pear cacti irrigated with water collected by nets that trap moisture from fog on a hillside in Lima, Peru.